Jim Loeffler joined CCGD in 2011 as accompanist for the Women’s Youth Chorus. 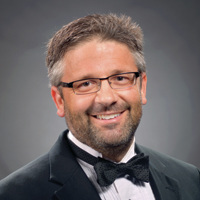 Mr. Loeffler is the Director of Music and Worship at Resurrection Lutheran Church in Plano, Texas. In addition, he accompanies The Texas Voices and regularly plays for student musicians throughout the Plano Independent School District. Previously, Jim served King of Glory Lutheran in Dallas, Evangelical Lutheran Church in Frederick, Maryland and congregations in his home state of Indiana. Mr. Loeffler is a singer and a composer. He has sung with the Orpheus Chamber Singers and the Choral Arts Society of Washington where he sang under such notable conductors as Robert Shaw, Christopher Hogwood, Leonard Slatkin, Yuri Termikanov, Eiji Oue, composer John Adams, and vocalist Bobby McFerrin, in venues including Carnegie Hall, Avery Fisher Hall, Royal Albert Hall in London and the Grand Tetons Music Festival in Jackson Hole, Wyoming. Mr. Loeffler has published seven sets of organ variations with Darcey Press in the collection 83 Musical Gifts, and has composed numerous works for organ, choir, brass, handbells, and children's voices, in addition to several commissions. Mr. Loeffler earned the Bachelor Music degree in Church Music from Valparaiso University (Valparaiso, IN) and the Master of Music degree in Choral Conducting from the University of Illinois. Mr. Loeffler's musical studies include the following: organ with Pamela Johnson, Douglas Reed, and Martin Jean; harpsichord with William Eifrig and William Heiles; conducting with Fred Stolzfus, Chester Alwes, Dennis Friesen-Carper, and Eldon Balko; and jazz with Billy Foster. His professional affiliations include the American Guild of Organists where he earned the Fellow's Certificate (F.A.G.O. ), and the Association of Lutheran Church Musicians.